Kill a hapless beggar in Ivarstead. Get the contract from Nazir. Report back to Nazir to collect your reward. Right after your initiation into the Dark Brotherhood, guild leader Astrid will confess that no "real" jobs are available at the moment and that you should talk to Nazir for smaller contract work. Nazir will give three targets to you at the same time, so you are free to pick what order you do them in. 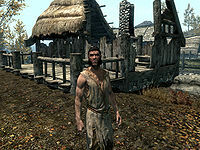 On Narfi, he will comment that "He's a hapless beggar living in some ruins just outside the village of Ivarstead. Easy even for you." Make your way to Ivarstead, the small settlement at the foot of the Throat of the World, and locate Narfi. Due to the roaming creek separating Narfi's worn-out house from the rest of Ivarstead, there are no watchful eyes from the Ivarstead guards, and as such, you can kill him in any manner you want. The easiest method is to kill him in his sleep; he goes to bed at 4am, so take advantage of the darkness and sneak into the cabin right after that time and dispose of the beggar. Note that the sawmill across the lake gets busy right after 7am, so don't wait too long. If you speak to Narfi before you kill him, you are given three dialogue options; you may only pick one as the conversation ends and you can't speak to him again. "Your pathetic existence has come to an end, Narfi." "Oh... Oh no... Please, please... I ain't never harmed no one... Old Narfi just wants to be left alone..."
"Beg! Beg for your miserable life!" "No! Oh, by the gods, please no!" Narfi won't defend himself as a result of any of these dialogue options, so if you are seen killing him, you cannot avoid a bounty. Once Narfi is dead, travel back to the sanctuary and receive your reward of leveled gold from Nazir, who will also comment, "Congratulations. You slaughtered an emaciated beggar in cold blood. You are truly an opponent to be feared." As soon as you accept the contract from Nazir, you will be unable to complete the miscellaneous Ivarstead quest The Straw that Broke. 200 Finishes quest Narfi is dead, and I have collected my reward from Nazir at the Sanctuary. On the PC, it is possible to use the console to advance through the quest by entering setstage DBSideContract01 stage, where stage is the number of the stage you wish to complete. It is not possible to un-complete (i.e. go back) quest stages, but it is possible to clear all stages of the quest using resetquest DBSideContract01.